This page has a patterned paper background, with another piece of pp stuck over it toward the right half of the page. 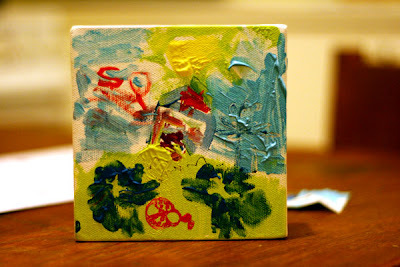 Then I painted gesso around that general area and when it dried I painted over the top lightly with watercolour paint. 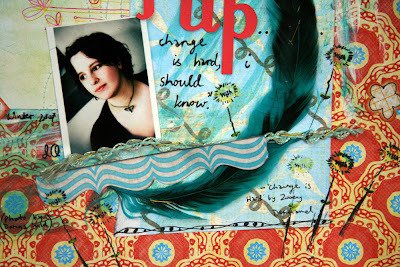 I stamped multiples of both the dragonfly and dandelion stamps from 'You Rock My World' in black Stazon ink. Then I watercoloured inside the stamping. And HERE is where I get my Lusi stamps and chipboard. Fun stuff! Edited to add: Check out Sienna's little painting. This is a 5" canvas, and she also used Lusi's stamps - the ladybird in the garden :) She finger painted our two cats on either side. So cute! 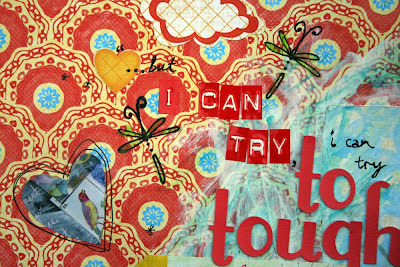 Just LOVE how you've used those stamps Danielle! GORGEOUS PAGE! I absolutely LOVE Sienna's Canvas too! I love it when the kids get involved and start their own creating too!!!! Sush a beautiful photo of you Danielle! You are looking well. Hugz and Kissez to the Family.